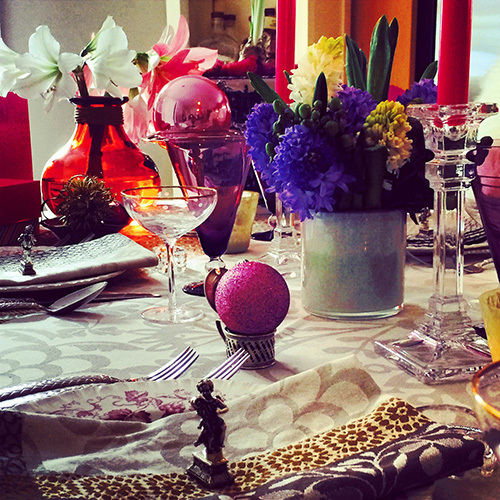 Setting a beautiful table is one of my favorite things. I love to use a mixture of new, antique, and keepsake items to create something beautiful, unique, and memorable for my loved ones. Here’s this year’s Valentine’s Day table. La Jacquard Francais linens. These were from Sallie Home in Clayton, Missouri. Also available at La Petite Maison in Hingham, MA. Antique Wedgwood Old Vine dinner plates. Ralph Lauren Equestrian Braid flatware. 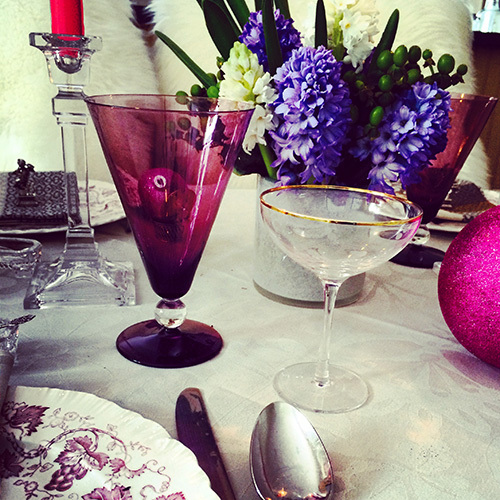 Vintage amethyst glass water goblets and various sterling pieces accented with pink and fuchsia Christmas ornaments doing double duty. Shearling rugs draped over the chairs add a little warmth during the polar vortex. Treasured valentines and a cast plaster handprint made my by children add a personal touch. Fresh blooming amaryllis and hyacinth arrangements. 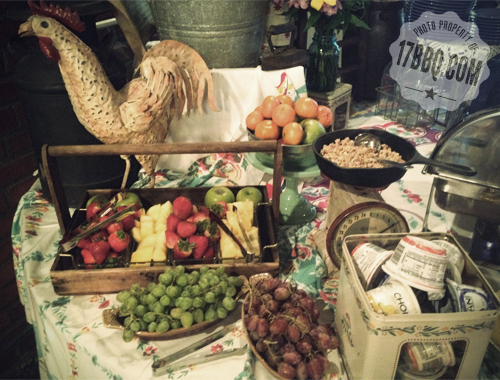 Becky Streuter, our catering manager, has a large collection of vintage and retro items from which to choose. These layered linens, cut glass dishes, and jadeite serving pieces create a beautiful table. The damask-covered slipper chair belonged to my grandmother. We eat with our eyes first and when people attend 17th Street catered events, we want our guests to be delighted when they see our set-up. From events held in our private rooms and Warehouse facilities to OnCue seminars, we love setting the stage with unique items from our collection. When you hold an event at The Warehouse, you can rent almost anything in our prop room with which to decorate and add a signature touch to your celebration. We can also suggest local event planners who can help create a special look. 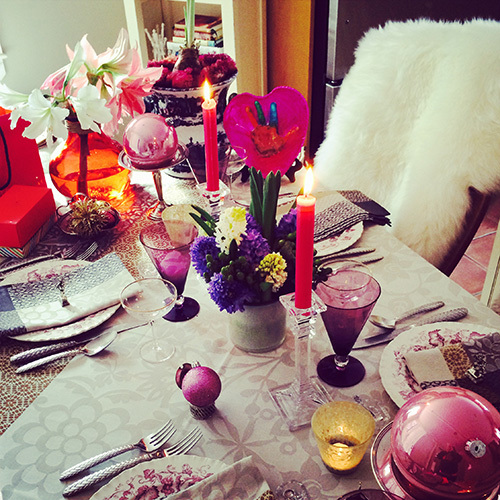 Here are some of my favorite tablescapes from recent events. 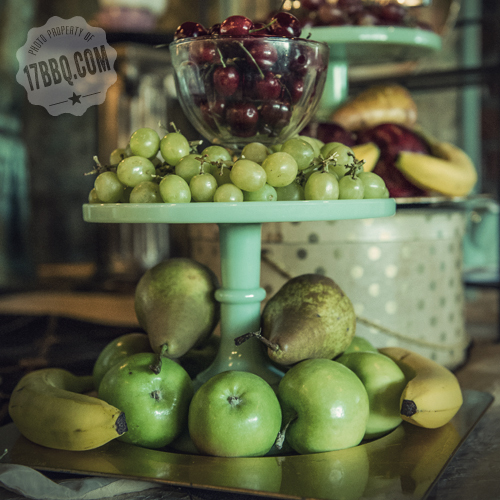 A jadeite cake stand atop a brass plate holds a variety of fruit on the breakfast table. One of the topics of our OnCue Catering Master Class discusses how to properly set up a catering line and how to make it look fabulous. These photos are from various OnCue Consulting events. Vintage linens create a colorful backdrop for a breakfast table. Weathered wood, old tin canisters, an antique scale, and cast iron create texture and interest. 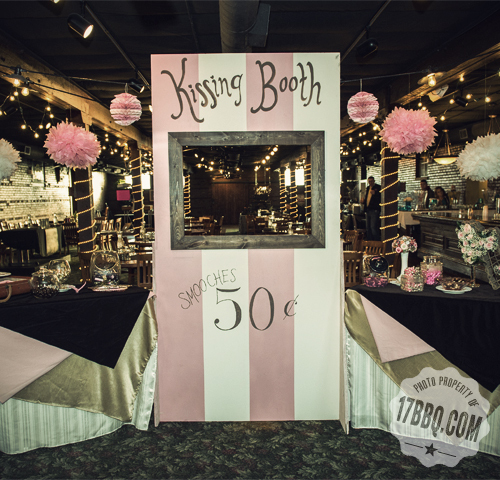 Clever, colorful, and sweetly delicious – this kissing booth display was both a candy bar and a photo booth where guests could pose for pictures. Sometimes simple is best. This display uses Bulleit bottles tied with twine, slices of wood, and mason jars filled with sprigs of rosemary clipped from a huge bush that grows outside our back door. The tablecloth is layered with a kraft paper runner. 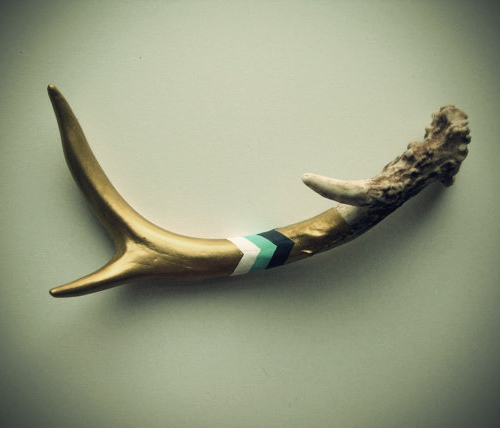 Inspiration for one of my favorite displays came from this photo of painted antlers I saw on Pinterest. I couldn’t justify paying $78 for one painted antler, so we put out the call for antlers and taxidermy to our family and friends. Turns out that these trophies are precious to some and they didn’t want us to paint them? Go figure! We ended up with an abundance of them and here’s how we used them. 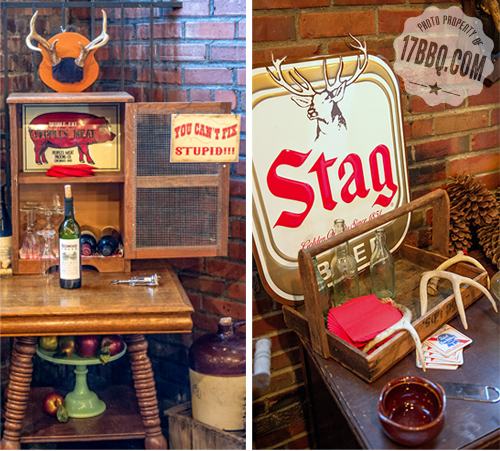 Our serve-yourself bourbon bar and wine station featured old wooden tables and boxes, a vintage Stag sign, and lots of antlers, both loose and mounted. 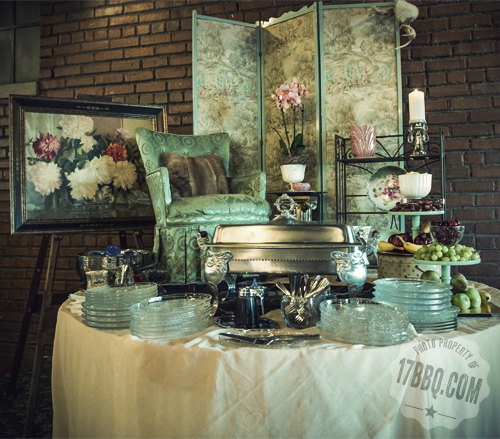 There are so many layers of goodness on this buffet table designed by Becky and local event planner, Cindy Wilson. They suspended an old ladder and tied on antlers, illuminating it with a string of mason jar lights. Natural elements such as pine cones, fresh rosemary, and wood slices mix with cast iron and tin. 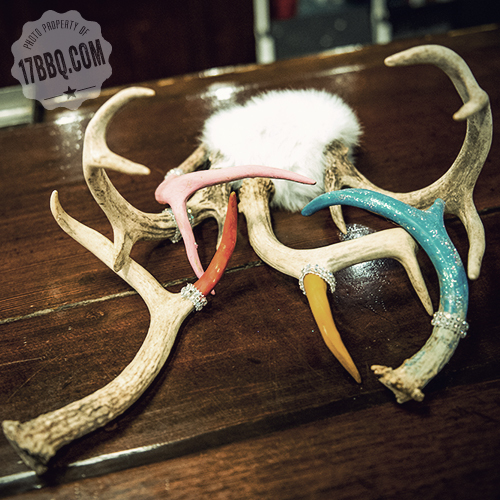 Not only are they painted, she fancied them up with a bit of iridescent sparkle, rhinestones,and marabou trim, and tucked them in and about several displays to add just a little girly touch amongst all of that manliness. 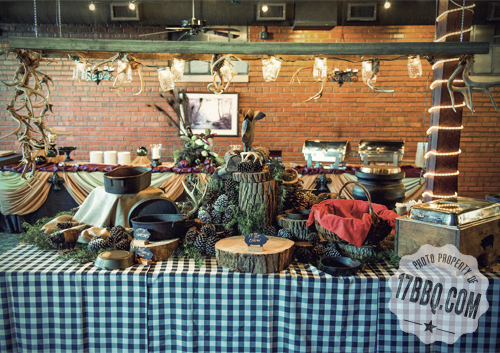 What are your favorite items to use in catering displays? To book your next event at 17th Street, please call Becky at 618-684-8902. For information on our upcoming OnCue events, email Amy. 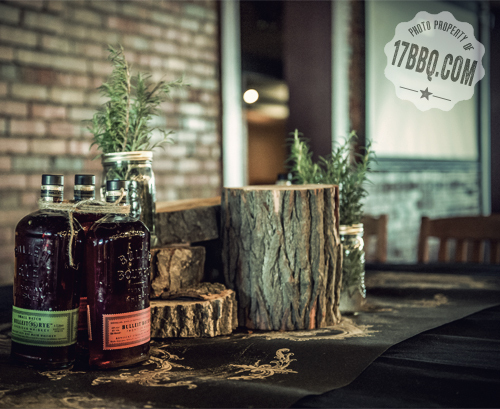 Just a few spots remain in our Catering Master Class on November 4–5, 2013 and the Whole Hog Extravaganza/Brisket Bonanza/BBQ MBA on January 20-21, 2014.